There has been a lot in the UK press recently about plastic usage, recycling and waste, and the enormous impact it has on the environment. It is now impossible to ignore the fact we all need to rethink our purchasing decisions and move away from plastics where possible. I always believed I was lucky to live in an area where our recycling is easy and comprehensive. If it’s glass, paper or any type of packaging (plastic, metal or cardboard) it can be recycled. This, alongside having a dog, chickens and a compost heap, for all food wastes, means we throw out very little black sack rubbish; one small bag every two or three weeks. But what happens to all the packaging, especially the plastics, that I recycle here in France? This was a question I wanted answers to as I was shocked to read that the UK has been sending 500,000 tonnes of plastic from it’s recycling centres to China, every year, (think about the fuel costs here) but China is now banning all imports of plastic waste. A while ago I was lucky enough to join a tour around our local recycling centre situated near Angoulême, in the Charente. My trip was an organised one for a group of local councillors, but Calitom encourage all guided visits, which can be arranged via their website here. 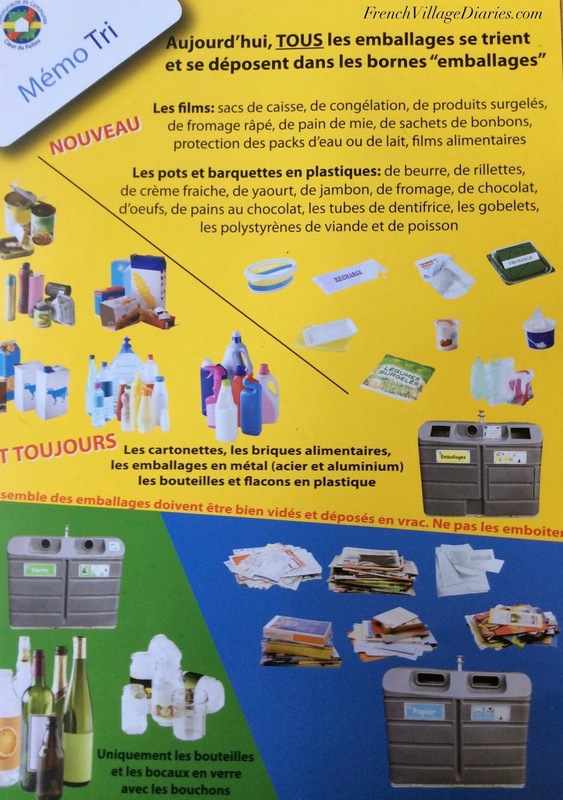 Calitom takes all the doorstep ‘yellow sack’ recycling from the Charente households, as well as the packaging recycling from our large yellow labelled communal bins here in the south Deux Sèvres. 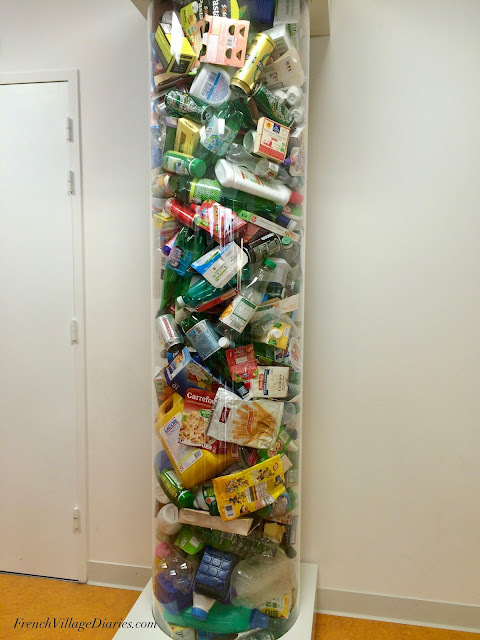 As you can see from the above images, all food containers, cartons and household product packaging; bottles, boxes, bags, tubs, pots, cans etc can be sorted here. Please note, lids should be left on plastic bottles and cartons, as the lids themselves are too small for the system; in fact, any item less than 6cm will be rejected as too small. There is no need to wash items before recycling (although I’m not keen on lingering food smells from yoghurt pots or tins of fish, especially in the summer) and items should not be stacked together but kept loose. At the centre, everything is tipped into the arrival area by the collection lorries and is then scooped up and onto a conveyor belt to begin the sorting process. It is one of the most advanced sorting centres in France and was a fascinating process to watch, but sadly no photographs were permitted inside. The first part of the process ‘tumbles’ the recycling to ensure the items are separated. Here the small bits (less than 6cm) are rejected, the majority of items continue to the next stage and any large boxes are removed to be sorted by hand. The second stage is the ballistic sorter that separates flat and not flat items, e.g. bottles and cartons go one way and paper heads off in another direction. The third part is the optic sorting, where light rays sort the different types of plastics and cartons. The fourth part is the magnetic sorting that removes food and drink cans and metals. At the end of the process there are a small team of people who monitor the sorted items and remove anything that has found it’s way incorrectly into an area. 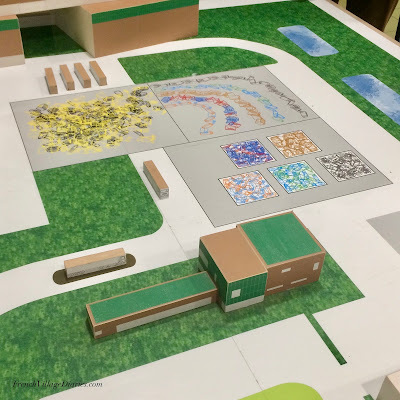 The sorted items are then made into large bricks of card, paper, clear bottles, coloured bottles and plastics, ready to leave the plant for the next stage. Paper and cardboard are recycled back into paper and cardboard, the paper bricks going to a recycling company in Spain, and the food and drinks cans also become new cans. Interesting fact: did you know that 19,000 cans could be recycled into enough metal to build a car? However, it was what happened to the plastics that interested me the most. 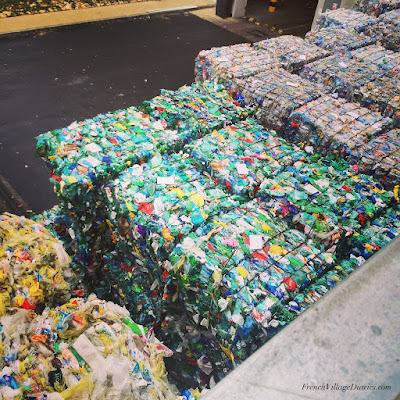 All plastic packaging from the sorting centre is taken by the company SUEZ who forward it to different recycling companies, depending on the type of plastic, but the process of shredding, crushing and melting down the packaging to allow the remanufacture of new objects, is the same. For example, PET (polyethylene terephthalate) packaging from transparent and coloured bottles, also used in fibres for clothing (fleece), goes to Regene, a company in Bayonne, in the Pyrénées-Atlantiques. HDPE (high density polyethylene) the most common plastic, from opaque laundry bottles, milk bottles and shower gel bottles etc, goes to Mix, a company in Brenouille, in the Oise department in the north of France. PP (polypropylene) packaging (all plastic trays) goes either to Mix or to Environnement, a company in Mende, in the Lozère department in the south, and all plastic films go to Machaon, a company in Châlons-en-Champagne, up in the Marne. While the word ‘plastic’ has become a household name and seems innocuous enough, I find the chemically sounding polyethylene and polypropylene far more sinister and I know I wouldn’t want to live next door to any of these companies. I am sure a world where our food is not sold wrapped in plastics would be better, but for the minute, I am reassured that in our area at least, these plastics are able to be recycled, and it is done so within France. Aside from the environmental impact; recycling 1 tonne of glass saves 700kg of sand, recycling one tonne of plastic bottles saves 800 litres of petrol and a tiny cell watch battery if thrown away contaminates 100m3 of soil for 50 years, recycling also reduces our black sack rubbish, which in turn reduces our rubbish collection costs. We were told we would see a 40% increase in refuse collection costs on our local taxes if we didn’t recycle anything. You can read more (in French) about Calitom on their website here and they also have a Facebook page here. If you have any top tips for living a zero waste or plastic free life, please do share. You might also like to join the Living in France Without Plastic Facebook Group, see here. This post has been linked to the #GoingGreen blog link at A Green and Rosie Life. Click here to read more.